What is a Table Selfie? Imagine a centrepiece that gets your guests talking while capturing some amazing pictures at the same time. With The Table Selfie you can have exactly that! This is the ultimate wedding ice breaker that also doubles up as a stunning centre piece. Wedding planning is stressful and time consuming and so having something that is both a centrepiece and a form of wedding entertainment is a huge time saver and stress reducer. The Table Selfie is a brand new, innovative “selfie taking” centrepiece. It’s a twist on the classic static centrepiece and is comprised of a spinning micro camera that can be paired with your guest’s mobile phones. Everybody is permanently glued to their phones these days and try as you might to discourage it, they are going to be part of your celebration, so it’s a great idea to try and incorporate them into the party. If you can’t beat them, join them! 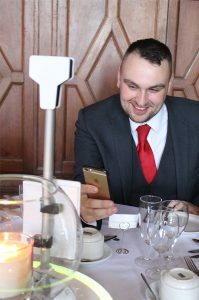 Once your guests have connected to the Table Selfie wi-fi and selected their table number, they can take their selfie which can then be saved, shared to social media or sent to your hired photobooth, or any other local printer. Not only is The Table Selfie a centrepiece and a entertainment solution all rolled in to one, it’s a great idea for party favours too as your guests can take their selfie-cam pictures away with them as a memento of the occasion. Both the Table Selfie and the picture print outs can be personalised and customised especially for your event. 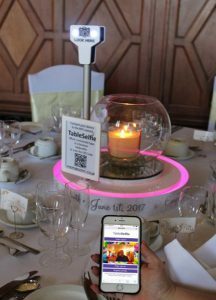 The Table selfie is available in a choice of colours so it can match an additional centrepiece should you wish and we can even display a message of your choice on the instruction plate. Whatever the occasion, be it wedding, birthday party or corporate event, The Table Selfie is the ultimate party starter for your celebration. Brand New For 2018 we are now taking bookings for this innovative service. 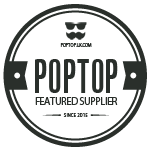 If you would like to enquire please complete the short enquiry form below and we’ll get back to you right away.